The secrets to perfect pasta, a journey through Australia’s Chinese restaurants and an introduction to Nigerian flavours can be found in June’s new batch of cookbooks. Australia is often cited as having the best Chinese food outside of China (a lot of people will say it’s even better than China itself), and the scene is way more evolved than what we get here in the UK (with the exception of chefs like Andrew Wong). Neil Perry is the head chef at Rockpool, one of Australia’s most acclaimed restaurants, and has loved Chinese food all his life. The recipes in this book offer an authentic taste of regional China – think yum cha dumplings, three-shot chicken and flathead fish covered in heaven-facing chillies and Sichuan peppercorns. It’s as far from sweet and sour chicken as you can get. African food is yet to really make a mark in the UK, but with the help of people like Zoe Adjonyoh extolling the virtues of Ghanaian cuisine and now Lopè Ariyo exploring the flavours of Nigeria, that’s all set to change. Ingredients like okra, yam, hibiscus and plantain are brought to the fore, opening up all sorts of new flavours, while dishes like Baked kuli kuli cod with cayenne yam chips or Osun’s sole will breathe new life into your weekly menu. Everything is covered – fruit, veg, grains, meat and desserts – and you’ll certainly find a few new flavour combinations you never knew existed. This is a huge undertaking of a book, containing 272 pages of colourful, celebratory, festive food from across India. 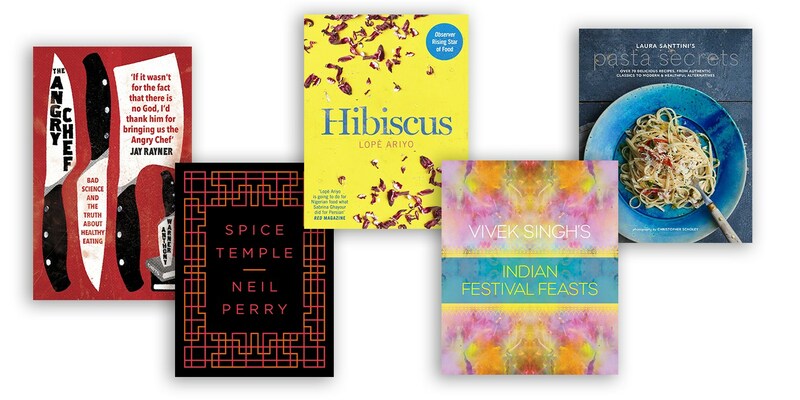 Vivek Singh is the head chef of The Cinnamon Club and there’s no one better to put together a collection of recipes made especially for occasions such as Holi, Onam and Diwali. From fried street food snacks that are perfect for big crowds to banquet-style dishes reserved for the most special of evenings, every recipe is bursting with flavour and colour. Each chapter also looks at the cultural significance of the food, and explains a little more about the festivals of India. Pasta has become so ingrained into our daily lives that rarely a week goes by without it appearing at our dinner tables. But to cook it and treat it with the same respect as the Italians requires a little bit of know-how. That’s what Laura Santtini is hoping to teach us in her latest book. With over seventy recipes, spanning both the classics and some more contemporary dishes, there are also in-depth looks into how to cook pasta properly, which shapes match with which sauces and why fresh isn’t always best. If you haven’t heard of The Angry Chef, be sure to check out his blog in which he takes a no-nonsense approach to the food industry and all its misinformation. His first book looks into the clean eating trend, and how specialist diets, bloggers and chefs themselves could actually be causing harm by promoting these fads. It’s not just a one-man crusade, however – he assembles a team of psychiatrists, scientists, economists and nutritionists to back up his sentiments with hard evidence. However you feel about wellness and clean eating, this is guaranteed to be a good read.